As a freshman at Seton Hall in 1968, I was lucky enough to have friends who were upperclassmen and who had local connections. Needing pocket money, I cut classes one day and took the advice of one of these guys and showed up for the hiring of daily workers (the "Shape," or "Shape-up"), at the Pabst brewery on South Orange Avenue in Newark. I don't remember the details about how I handled age verification, but suffice it say that it was lax, and on that on the very first day I was assigned to a quality control assembly line in the factory, checking for bottles containing more or less than exactly 12 ounces of beer. The 7 hour shift, which paid about $50 (a lot of money in 1968) comprised of a 45 minute lunch hour and two 20 minute "beer breaks." The lunch/break room was fluorescent bright but windowless and bare, with concrete walls decorated with a few old yellowed Pabst posters. An industrial-sized beer refrigerator dominated one corner. You could tell instantly whether a worker was a long-timer, as these veterans only drank the warm beer stacked up in mounds of cases along the far side of the room. Stern signs warned that you could drink all the beer you wanted in this room, but would be fired on the spot if you tried to bring one bottle outside. As an under-aged drinker, I was agog at the thought you could drink all the beer you wanted during the 3 breaks. At the first break, I had 2 or 3 cold beers, and talked with a few old-timers in the room. No problem returning to the assembly line, sitting on the stool watching all the bottles trundle by. In fact, at the time, I thought there was a certain enjoyable rhythm to this roll. At lunch, there was a large crowd in the lunchroom; it was hot, stuffy, and smoky. I washed down my brown-bagged sandwich from Roscommon House with 4 or 5 cold Blue Ribbons. I returned to my assembly line stool to begin the rest of the shift. Shortly afterward, I began to feel uncomfortable. The bottles now seemed to travel much faster and were no longer dancing in a pleasant conga line, but were now growling and surging past me like an evil rush through whitewater rapids. It soon occurred to me that I hadn't yet visited the factory Men's Room, even after consuming 5 or 6 beers. I don't remember what happened next, except that I was on the floor, passed out. The assembly line had been shut down in my honor, and I was the focus of everyone's attention. I remember well my horror, until all at once everyone started laughing. The foreman, between wheezing fits of laughter, sarcastically asked if I needed another beer. I had been christened! 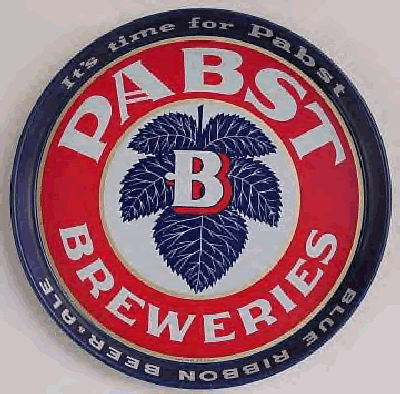 Afterward, whenever shaping at Pabst I was known as "Diapers." A few weeks later, my friend Bob suggested I go out on a Pabst delivery truck with him, supposedly better than a shift inside the brewery. We lugged kegs down narrow stairs to filthy cellars ruled over by rats and cobwebs. We also maneuvered hand-trucks laden with cases of long-neck, returnable ("exports") bottles to coolers behind the bars. The senior guy drove the truck and called the shots, and the junior guy counted up the cash collected and kept account of what was delivered. Bob warned me that we shouldn't start accepting bartenders' offers of a set-up drink until the end of the route. We mostly took that advice, but one hot July afternoon we couldn't avoid a cold one or two. Having started our route around noon, we finally pulled into the Grove Street lot close to midnight, more than a few dollars and bottles short! One day, unaware of my age, the shape supervisor assigned me to a delivery truck as the senior guy. He called on a "rookie" to ride shotgun with me. Our route included the North, Central and South wards of Newark. Though I had moved out of Newark with my parents long before, I felt confident that I knew the city, especially North Newark, well enough to accept this assignment. Undaunted by the Riots which had occurred only months prior, we set out to deliver to the many taverns on our route. I took my friend's advice about not drinking early-on, thus we did well tending the many establishments on Bloomfield Avenue, and throughout the North ward and Belleville. Feeling smug, we proceeded to the Central ward. I picked a quick route from memory, but unfortunately, the State Police were not amused that I was driving a commercial truck on the Garden State Parkway (a major no-no) with a Massachusetts JUNIOR Drivers License! Attesting to the goodwill of Pabst Blue Ribbon, and my beginner's luck, the trooper let my partner drive (who was barely 21) and allowed us to continue on via City streets only. The delivery route took us to some tough neighborhoods throughout the Central and South wards, but there were no problems. The bartenders (most of whom were black), were very kind and protective to us two white college kids, taking care to direct us to the next gin mill on the route. I learned many life lessons working with the fine people of Pabst and the tavern-keepers of Newark.